Ris Church and Cemetery. Photo: @2014 Stig Rune Pedersen. The Norwegian Royal Court confirmed today in form of an e-mail written by Assistant Head of Communication Sven Gj. 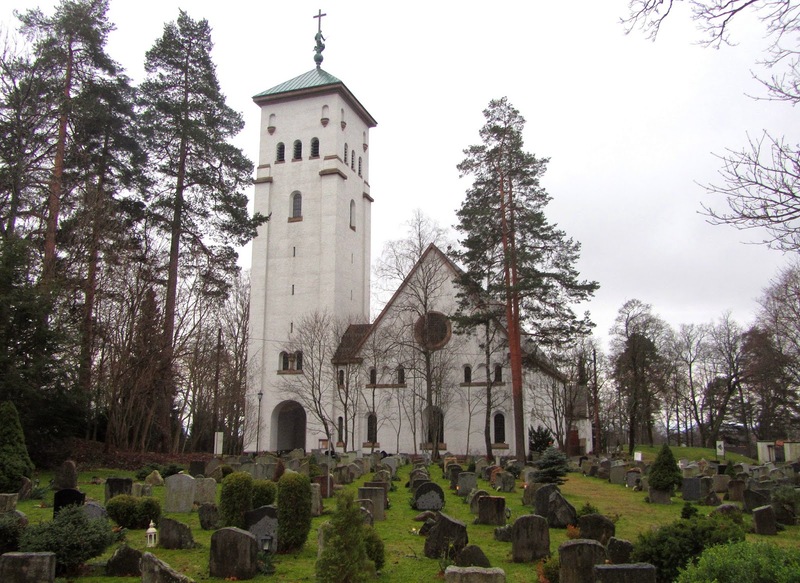 Gjeruldsen that Johan Martin Ferner, who died on Saturday 24 January 2015, will have his last resting place at Ris kirkegård (Ris cemetery) in Oslo. Princess Astrid Mrs. Ferner and Johan Martin Ferner have lived in the parish of Ris since they got married in 1961. Ris Cemetery is also the place where Queen Sonja's parents Karl August and Dagny Haraldsen as well as her sister Gry are buried. Ris Cemetery only has urn graves, so following the cremation at Alfaset I gather that the urn will be interred later on when the the ground is not longer frostbound. I will come back to this in due time when the headstone has been put up. After I received the e-mail, I learned that the court reporter Kjell Arne Totland had already written about Ferner's last resting place in his blog, but he didn't state his sources. The funeral service for Johan Martin Ferner, who died on 24 January 2015, took place at Holmenkollen Chapel in Oslo today, with bishop emeritus Sigurd Osberg and parish pastor Jan Erik Heffermehl officiating. In attendance were - besides Johan Martin Ferner's widow Princess Astrid and her nearest family - King Harald, Queen Sonja, Crown Prince Haakon, Crown Princess Mette-Marit, Princess Märtha Louise and Ari Behn, as well as other Ferner family members and many friends. Former foreign secretary Thorvald Stoltenberg, an old friend of Princess Astrid, and Crown Prince Haakon's former girl-friend Cathrine Knudsen, also attended. The funeral service was described as private, meaning that the media was not allowed inside the chapel during the ceremony. A small pool of photographers covered the event when the mourners entered and left the chapel. From today's press release from the Royal Court we learn that the ceremony was opened by the musician Ole Edvard Antonsen's trumpet with Aaron Copland's "Fanfare for the Common Man". A group of soloists from the boys' choir Sølvguttene ("Boys of Silver", the Norwegian Broadcasting Corporation's boys choir) sang "Pie Jesu" by Andrew Lloyd Webber. Antonsen also rounded off the ceremony with "Ave Maria" (Bach/Gounod). Hymns during the ceremony were "Alltid freidig" and "Deilig er jorden" ("Fairest Lord Jesus"). The organist was Petter Amundsen. See also photo and film coverage at VG.no, Dagbladet.no and NRK.no. Among the many wreaths can be spotted one from the Grand Ducal family of Luxembourg as well as the one from Princess Astrid (green ribbon). Updated on Monday 2 February 2015 at 22:35 (typo corrected; first paragraph modified).